Edward T. Foote II was a fellow who took on extraordinarily complex problems and proceeded to solve them, sometimes leaving friends and family wondering how he successfully navigated such dangerous waters, and just as often, secretly wondering why he took on the jobs he did. Mr. Foote, formerly of St. Louis, died Monday in a nursing home in Cutler Bay, Fla., of complications of Parkinson’s disease. He was 78 years old. He was born in Milwaukee and moved from there with his family to St. Louis in the mid-1960s. He attended John Burroughs School here, took his bachelor’s degree from Yale and his law degree from Georgetown University in Washington. Edward Thaddeus Foote II was a presence. He served in the U.S. Marine Corps; and in civilian life was tall, elegant, patrician, carefully groomed and tweedy. He was smart too, and charismatic, and spunky, and his voice, although certainly not stentorian, commanded attention and resonated with authority. Perhaps in contrast to all that, he was a gentle and thoughtful man – the sort who remembered you warmly after decades of separation, and asked after your family, and left you feeling as if you were the only person he wanted to see. A measure of his commitment to his friends and neighbors, and to the city of St. Louis, was his decision to help to turn around his on-the-skids St. Louis neighborhood by founding a new neighborhood elementary school. In the late 1960s, Mr. Foote and some of his many friends and neighbors decided to go after the problems of the Central West End head on rather than to passively bemoan the deterioration of the neighborhood. Edward T. (Tad) Foote II helped start New City School, worked on desegregation plan and headed the Washington University School of Law. Education, Mr. Foote emphasized, was fundamental to a revival. If there were no good schools available to families, those families would jump ship. After two schools operated by the Roman Catholic Religious of the Sacred Heart closed – City House and Barat Hall – some families did indeed pack up and leave. In response the New City School came to be in 1969. Its bedrock philosophy was sound: the school was to be progressive and welcoming and inclusive, and diversity would be celebrated. Scholarships were to be plentiful. Learning was meant to be an occasion of joy rather than drudgery. New City continues today following those principles and exists as an urban anchor and national center of educational dynamism. It is a monument to the foresight of the man everyone called Tad. In the 1960s and ‘70s, he was an academic himself, pursuing a distinguished career at Washington University as general counsel, then as dean of the School of Law, where a professorship is named for him. His last job at Washington U. was special adviser to the chancellor and board of trustees, a position he held in 1980 through 1981. Mr. Foote facilitated the innovative transfer program. Susan Uchitelle, an educator with years of experience with educational programs and efforts to desegregate public schools in the region, recalled that Mr. Foote was appointed by the U.S. District Court to serve as facilitator to get all parties together to plan for the next steps in the voluntary desegregation program. Once he was appointed he needed help understanding context and history and the problems facing the schools, which some regarded as intractable. Uchitelle provided the information and the help he needed to fulfill his responsibilities to the court, and, she said, he worked hard to get the court to agree to implement the plan that would allow children to transfer from city schools to schools in St. Louis County districts and county students to transfer to city schools . “He got everybody together and worked as much for the city and the county. That was his role and he did his job with great integrity -- and he actually got the program started,” she said. John Biggs was a Central West End neighbor, a best friend and running and tennis partner of Mr. Foote. 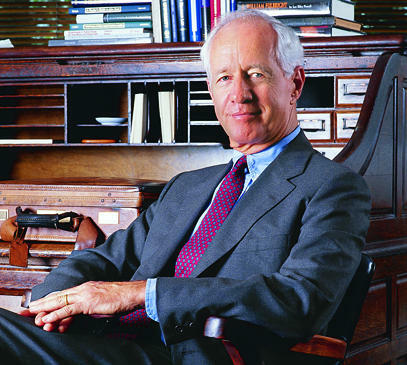 Nowadays he is a director of the Boeing Company and the National Bureau of Economic Research and a trustee of Washington U, and previously chairman and CEO of the financial services company TIAA-CREF. Mr. Foote put Biggs on the desegregation committee, and on Wednesday Biggs recalled the problems faced by the group and Mr. Foote. “The federally appointed desegregation committee was half black and half white,” Biggs said, “with an incredibly difficult city-county demographic problem and intense emotion on both sides. Later on Mr. Foote returned to academic life, taking on the presidency of the University of Miami. When Mr. Foote and his family arrived in Coral Gables, it was emerging from the doldrums of mediocrity. The university presented a number of challenges besides reputation to the new and, at 43 years of age, very young president. Because of his penchant for strolling into trouble, various storms beset him. Hurricane Andrew cost the university $23 million. And obnoxious behavior arising from the university’s football team caused him embarrassment. Mr. Foote's height made him stand out, as seen in this photo from his days in Miami. “Tad Foote was an extraordinary human being, a wonderful friend with an effective analytic intelligence. He saw what would make the world around him better and set out repeatedly to do so. He came to Washington University in the 1960s as the institution’s first full-time counsel to deal with issues raised in response to student activism. He was liked, trusted and admired by all and a great help in working through the issues of the day. “In the 1970s, a law school dean left over differences in academic priorities that brought regular visits to the chancellor’s office from alumni, faculty and students. Tad Foote agreed to go as acting dean to see whether he could help. “Mr. Foote was a natural leader who understood his fellow humans. The complaints stopped immediately. The school began filling vacancies with able scholars. Mr. Foote had never taught a course or written a scholarly paper, but after a while he was, with the support of the faculty, asked to be regular dean. He and the faculty then modernized the Law School and recruited outstanding students and faculty. “When the chair of the search committee for a new president of the University of Miami called, he asked many questions,” Danforth continued. “Finally I said, ‘I’ll be as clear as I can. Tad Foote is extraordinary in every way. You’d be very fortunate to have his as president.’ That is the way I felt and it worked out that way. Luis Glaser went with him as provost. My prediction turned out to be right. They with other colleagues did a fabulously good job of modernizing that institution. Tad continued to make the world a better place. I will miss him; so will many others." Danforth’s successor Chancellor Mark C. Wrighton continued this stream of remembrance and appreciation. “I first met Tad soon after my arrival in St. Louis as chancellor at Washington University. I had already heard of his great leadership at Washington University, and as a new chancellor, I valued greatly the opportunity to interact with Tad, who had emerged as a very successful president at the University of Miami. Importantly, he knew a lot about Washington University, too. He was a person of uncommon commitment to advancing the careers of others, including his students and faculty at the University of Miami. He was a wise counselor to me, and I came to value his friendship as our careers unfolded. 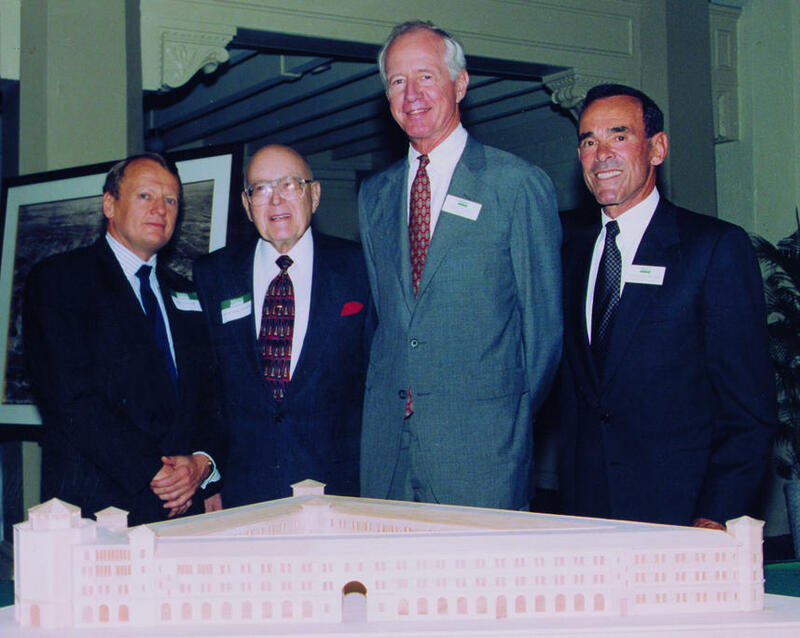 “Tad did more for the University of Miami than any of their presidents and contributed to advancing the quality and impact in very significant ways. He was a highly respected leader in higher education, and was sought out by many for advice and counsel. Mr. Foote is survived by three children: Julia Foote LeStage and William Foote of Boston; Thaddeus Foote of Coral Gables; and eight grandchildren. His wife, Roberta Fulbright Foote, died in May. Mrs. Foote was the daughter of the late U.S. Sen. J. William Fulbright and Roberta Waugh Fulbright. This fall more than 2,500 students climbed on board buses and into taxis leaving the unaccredited Normandy and Riverview Gardens Districts for accredited districts in St. Louis and St. Charles Counties. The migration began after a ruling this June by the Missouri Supreme Court, which upheld a controversial state law. It just so happens that the two unaccredited districts are predominantly African-American, and the districts chosen to receive them are largely white. As St. Louis Public Radio’s Maria Altman reports that’s drawn some comparisons to an earlier time.